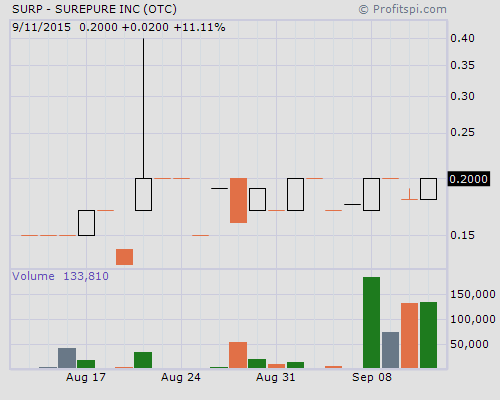 SurePure Inc. (OTCQB: SURP), a company that has developed technology for using shortwave ultraviolet light to purify turbid liquids such as wine, fruit juice and milk, is looking like it’s getting some love to match its bottom line. During the course of last week’s four day trading period, shares of SURP stock saw a consistency in trading, nearly $100,000 over the four sessions, that had not been seen all year, with shares trading in the range of 0.17 – 0.20. With little reason as to why the consistent activity picked up suddenly, keeping a close eye out on what developments may come that could add even more positive data to the net income for the current period will surely be on the minds of some value traders this week. SurePure, holders of patents in 66 countries for their technology, considers itself a global leader in liquid photo-purification having already designed a system to treat food-grade applications – a system that has successfully been applied to liquids such as dairy products for animal consumption, protein products, bovine blood plasma, water, brines and sugar syrup solutions. Applied to clear water successfully for years already, the Company takes using UV light as a surface sterilizer to whole new level by being able to process opaque or turbid liquids, virtually eliminating the limitation the application can be used for. The business model has been working so well thus far that to say the most recent balance sheet and income statement are as healthy as a horse would be an understatement. For the three months ended June 30, 2015, SurePure had revenues of roughly $1,452,000, a 2,804% increase compared to the roughly $50,000 booked during the same three month period in 2014. The top line numbers were good enough for SurePure to post a net income of approximately $123,000 for the three period – a substantial improvement compared to the -$959,000 loss during the same period the year prior. As good as that all sounds, it gets even better when you see that the Company’s stated goal is to grow significantly over the next five years through the use of working capital and equity financing, yet the share structure of 47,345,816 issued and outstanding remained from the 10K filing to the most recent Q filing. That changed slightly last month after M Cubed Holdings Limited agreed to purchase 1,676,000 shares of SURP stock in exchange for the cancellation in full of loan indebtedness of ZAR 3,542,204 (approx. $260,000). Some more debt on the books, $1,148,000, was removed by issuing 2,150,000 shares to CEO Guy Kibble and another 4,500,000 shares to CFO Michael Stephen Robinson. The removal of debt is a very healthy move for the balance sheet – a move which should help facilitate SurePure in obtaining the financing they require to expand further. Having had cash of roughly $60,000 as of June 30, the need for funds to operate are less important than the need for funds to grow. For whatever reason, SURP stock saw some consistent action last week which makes watching it into this week and and next month a smart move for those who look for pennies that have a strong chance of uplisting one day to a big board. News is not something that will push SURP shares above their 0.40 52Wk High, but give it a year or so and the $1 mark could easily be in front of the current 0.20 price quote.